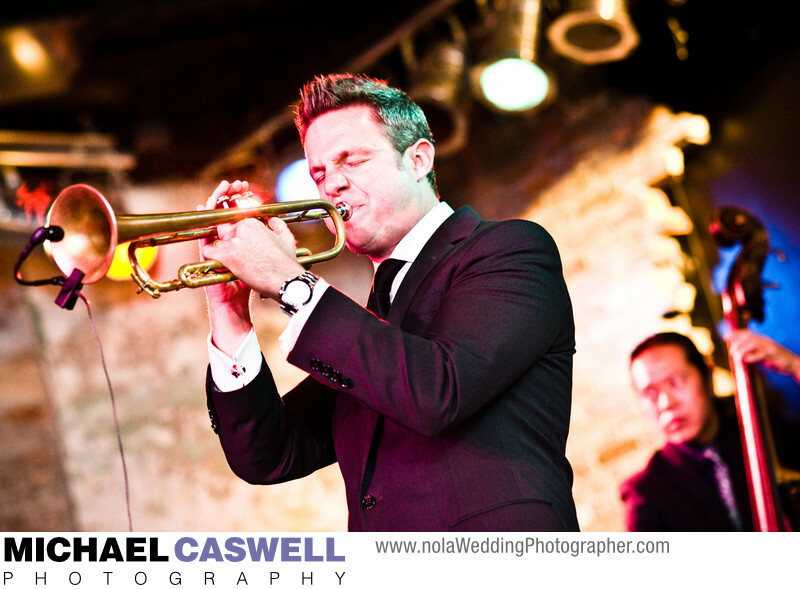 Famed New Orleans jazz trumpeter and singer Jeremy Davenport performs for a wedding reception at Tipitina's now closed French Quarter location. Though Davenport can usually be found playing at the elegant and sophisticated lounge that bears his name in the Ritz-Carlton Hotel, he was a personal friend of the groom and with his fantastic band of professional musicians, it was a real treat to have such amazing jazz entertainment at a wedding. One of the best things about having a wedding in New Orleans is the immense number of options for entertainment during your reception. Choices range from pure jazz musicians such as Davenport and his band, to high-energy and flashy acts like performing a wide variety of dance hits from over the decades, to bands that are best suited for more modern music. There are also bands that are able to bridge a variety of musical genres by starting off with light jazz during the early part of the reception while guests are making their way in and eating dinner, then ramping up the performance as the night progresses. Though the Tipitina's name is synonymous with music in New Orleans, many people don't realize that they also can host private events such as weddings. The famous uptown music venue has been in operation since the 1970s, and having your wedding there directly benefits New Orleans area musicians and high school marching bands via Tipitina's Foundation. Location: 233 N. Peters Street, New Orleans, LA 70130.